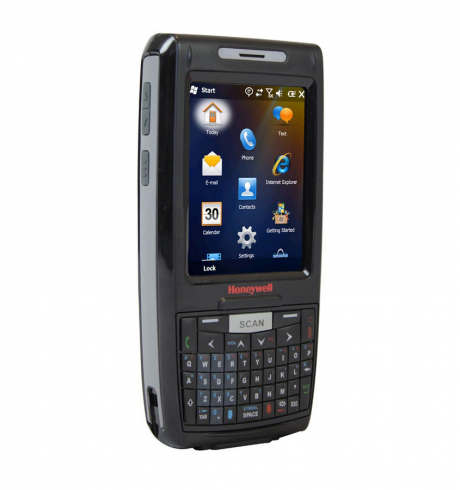 The Honeywell Dolphin 7800 is a multi-faceted mobile terminal with an integrated 1D/2D imager and optimal communications possibilities. The powerful 802.11 a/b/g/n Wi-Fi technology allows for reliable data and voice exchange. Via software control, you choose the best available network at any time and change between GSM and CDMA even during operation. Thus, the Dolphin 7800 is ideal for field staff who think an industrial terminal is too expensive and cumbersome. The inner magnesium frame and hard plastic casing meet IP64 standards and ensure for the necessary robustness and light weight needed for outdoor use. The terminal withstands rain, falls of up to 1.5 m and even temperatures of -10 to +50 °C. The integrated 800 MHz processor, 256 MB RAM and 512 MB Flash provide enough resources for professional applications. The 8.9 cm (3.5”) VGA touch display impresses with its high readability in different lighting conditions. Input is done simply by using your finger, or via stylus. Mobility and functionality increase thanks to the integrated GPS and the three megapixel colour camera with flash. Also, there are different keyboard layouts available.